Network operators are facing the increasing challenge of integrating and maintaining a variety of proprietary hardware, compounded with increased energy costs, capital investment and space requirements. Carriers are expected to deliver new revenue-generating services in rapidly evolving markets with reduced time to bring the service to market. At the same time, IT organizations are being asked to deliver new services and functions at increasing speeds and decreasing CapEx and OpEx costs, with increased agility and cost effectiveness. Many core networking services including switching, routing, load balancing and VPN can now be performed by software either running directly on x86-64 servers or running as virtual machines, therefore more networking functions are being migrated to standard IT, high-volume server environments. Through Network Functions Virtualization (NFV), network services are virtualized via software, giving network operators a different approach to designing, deploying and managing networking services. NFV replaces dedicated network hardware with virtualization software running on commodity servers. NFV decouples network functions from proprietary hardware appliances and implements the network functions through software. NFV utilizes standard IT virtualization technologies that run on a range of industry standard, high-volume service, switch and storage hardware to virtualize network functions. With VirNOS™, IP Infusion provides carriers, service providers, enterprises and network equipment manufacturers a complete NFV-based software package which customers can run, as-is, on top of the standard server platform. IP Infusion customers can integrate VirNOS into their software offering and thereby be able to add services and features more quickly. CAPEX reduction: Allows for the purchase of commodity servers (standard Intel) instead of purpose-built hardware and supporting pay-as-you grow models. OPEX reduction: Requires less space, power and cooling requirements and simplifies the launch and management of new network services. Single platform: Can use a variety of multi-version and multi-tenancy network appliances, allowing use of a single platform for different applications, users and tenants. Resources can be shared across services and different customer bases. Industry proved ZebOS-XP platform: Leverage matures code base, assuring interoperability with many different existing pieces of network equipment. ZebOS is used by more than 250+ vendors around the world. The Data Plane application in IP Infusion’s VirNOS supports various network interfaces. In order to achieve the high forwarding performance, IP Infusion’s VirNOS supports SR-IOV and PCI passthrough mode with Intel 1/10G Network Interface Cards. 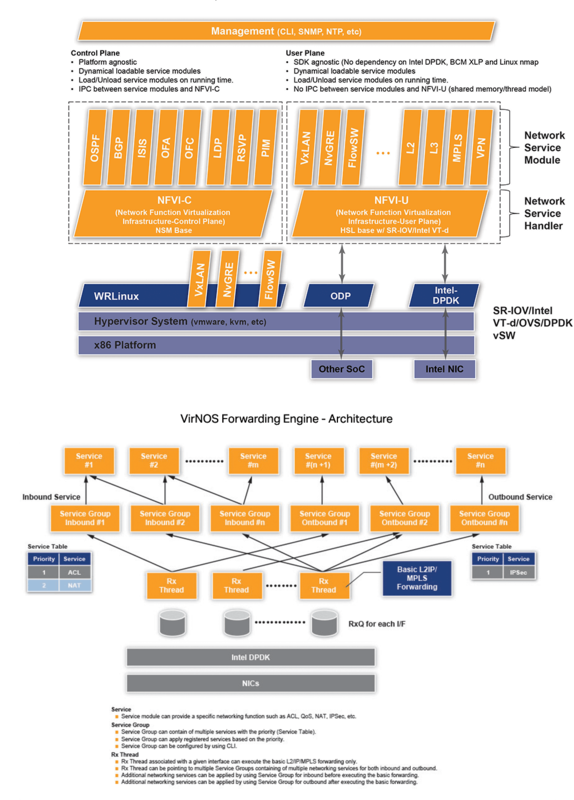 In order to achieve flexible service chaining, IP Infusion’s VirNOS supports Linux bridging, Open Vswitch bridging and Intel DPDK vSW. Based on the deployment environment, a suitable network interface can be used with IP Infusion’s VirNOS. 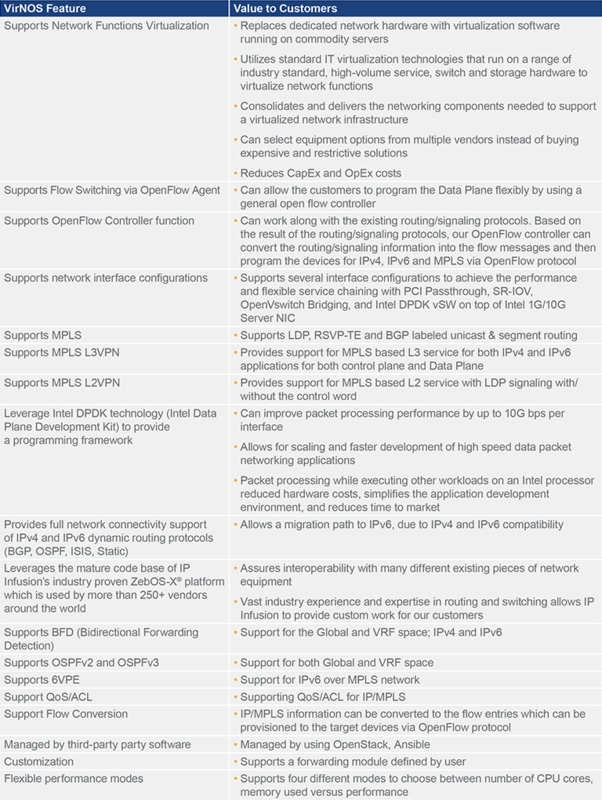 The VirNOS™ Product Brief includes a product overview, system architecture, and a comprehensive list of features and benefits to support NFV, OpenFlow, multiple data path pipelines, and network connectivity. 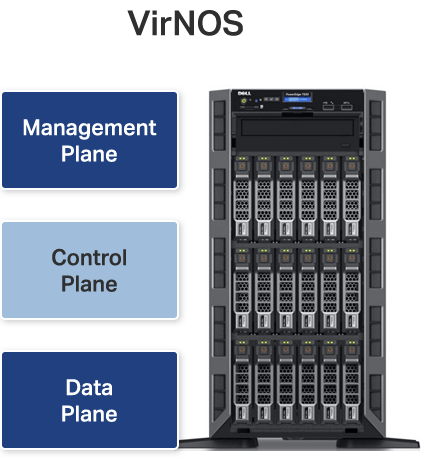 The VirNOS™ Data Sheet provides a product overview and detailed list of system level features including Layer 2, Layer 3, MPLS support, SDN Functionality, Management, Security, and QoS features. The VirNOS™ 2.4 Product Bulletin features a product overview, features/benefits, network configuration, functionality, general requirements, module overview, data plane infrastructure, IPv4/IPv6 forwarding performance, and supported features. plane to offer stable performance.